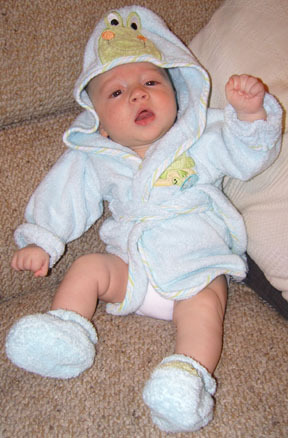 I’m da champ in this bathrobe and slippers with a frog motif. Mommy found them on eBay for half the price of what Babies R Us charged. Within days of losing my job last year, I was shocked to learn I was pregnant. After fourteen years of marriage, my husband and I had assumed we would never have children, and many family members had completely given up hope for such a blessed event. 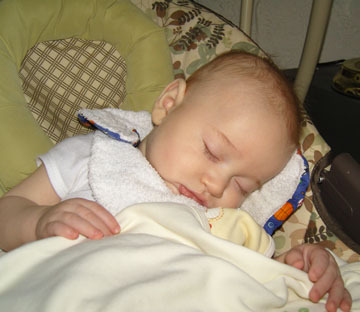 Thrift stores: Thrift stores are excellent sources of maternity and nursing clothes, toys, and books. Because stock shifts constantly, it’s good to visit frequently. Pregnant women usually wear maternity clothes for just a few months, so these items often arrive at thrift stores still in excellent condition. The same holds true for children’s clothing. Watch for sale days in order to save even more. Garage sales: Although the selection at yard sales can be hit-and-miss, the prices are generally the lowest you’ll find anywhere. Visit as many garage sales as your schedule will allow before the baby is due. If you arrive at the end of the day on the last day of the sale, don’t be afraid to ask for special deals, as the sellers may be wondering what they are going to do with all the items that still haven’t sold. It’s easy to sleep when I’m surrounded by so much love. Mommy’s friend gave her the onesie, another friend made the bib, and a third friend gave us the hand-me-down swing. Mommy keeps me warm with a snuggly thrift-store blanket. Consignment stores: Many consignment stores cater to babies and moms and can be a treasure trove for the frugal shopper. Let the shop owner know what particular items you’re looking for, and she can alert you when she receives those items. Also, watch for end-of-season sales and stock up several months or even a year in advance. Baby stores and departments: After my husband and I registered for baby items at two stores, we had a much better idea of pricing and were able to pick up many more items from used sources. We knew a great deal when we saw it, and we knew what brands and styles appealed to us. When we saw these items at our favorite secondhand stores, we also could note how well they had fared with regular use. 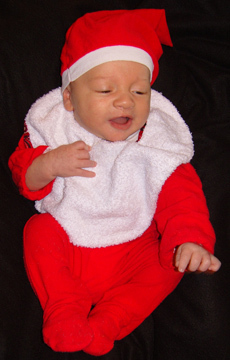 At Christmas, Mommy dressed me up in a Santa suit that she and my uncle and cousin each wore when they were small. I like to help her recycle. Friends and family: When we announced the pregnancy to friends and family and mentioned that we would gladly take any hand-me-downs offered to us, some family members began shopping for us at secondhand sources. Their locations in other parts of the country greatly increased the selection. Once I knew what brands and sizes worked best for me, I passed along that information so they could shop more knowledgeably. Other friends began offering everything from clothing to baby gear to information about free magazine subscriptions. I have graciously accepted everything offered, and if I later find I cannot use something, I pass it along to someone else who can use it. After utilizing all of these sources, I washed and sorted my son’s clothing by size before he was born. Now I am able to “go shopping” in his closet each time he outgrows his current clothing size. And as I see what particular items he lacks, I add just one or two pieces to my shopping list to round out his current-size collection. When he outgrows a size, I also have the option of taking all those clothes back to a consignment store where I can earn cash or store credit. Recently my husband found a news article that stated that a middle-income family can expect to spend $221,000 on a child from birth through high school. We look forward to providing for all our son’s needs and living a wonderful life with him at a fraction of the cost! Our county library has a wealth of free information. Our insurance company offers a free program that gives its pregnant clients e-mail access to a nurse. Any time I had a question, I could jot her a note, and she would answer within a day or two. My midwives’ office offers a Centering Pregnancy group, where instead of seeing a doctor for a short office visit, I went to a 2-hour group session. Each mom-to-be received a regular checkup, vast amounts of information, and could share pregnancy questions and stories with other moms. The midwives’ office also boasts a bookshelf with books on all kinds of pregnancy and childrearing topics free for the taking. This entry was posted in The Fiercely Frugal Shopper and tagged creative solutions, frugal shopping, kids. Bookmark the permalink.